Holy Land Olive-wood Nativity Ornaments, "Holy Land"
Each year, thousands of Christians make a winter pilgrimage to the holy city of Bethlehem, following in the footsteps of the biblical Magi. Many return home with souvenirs of hand-carved olive wood, a craft tradition among Bethlehem’s Christian community since the fourth century. 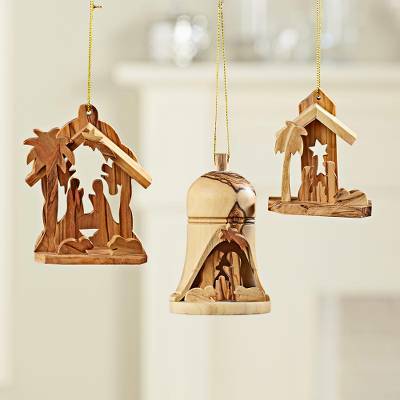 These ornaments feature three variations on a simple Nativity scene, in keeping with the story of Jesus’ humble birth. Handcrafted at a family-owned studio in Bethlehem that was founded in 1880.
"" how nice they are""
They were divided and made a small gift for each person to hang on their tree. So satisfied with them! "This gift wll be treasured forever!" These nativity ornaments are beyond description!. They are so beautiful! They're quite pretty and a nice addition to our tree this year. I am thinking about getting a set for a friend next Christmas.